Securely back up, sync, access and share your important content across operating systems & devices – anytime, anywhere, with Verizon Cloud. 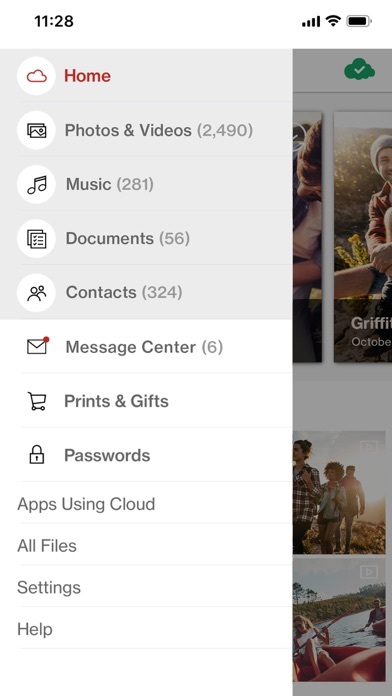 All of your contacts, photos, videos, music and documents – all in one safe place. Download Verizon Cloud today! Premium features allow you to: • BACK UP your photos, videos, contacts and more to a secure cloud storage • SYNC & ACCESS across devices – Backup, sync and access your content when you need it, from your smartphone, tablet or computer • EASILY MANAGE your Verizon Cloud account and storage plan • ORDER PHOTO PRINTS & GIFTS using your favorite photos in app • CREATE CUSTOM PHOTO COLLAGES & ADD STICKERS TO PHOTOS – Do even more with your photos by creating collages, adding fun stickers and editing your photos directly inside the app • EXPLORE FLASHBACKS – Relive your memories from past years with Cloud’s weekly Flashback photo feature • DISCOVER VIDEO STORIES – Using the photos and videos right from your Cloud, easily create custom movies using unique filters and music • BEAM TO YOUR TV – Share your pictures, videos and music with family and friends on the big screen • SHARE select media content from your Cloud using your favorite native apps Get started with a premium Verizon Cloud account today to securely back up, access & share photos, videos, contacts & more! 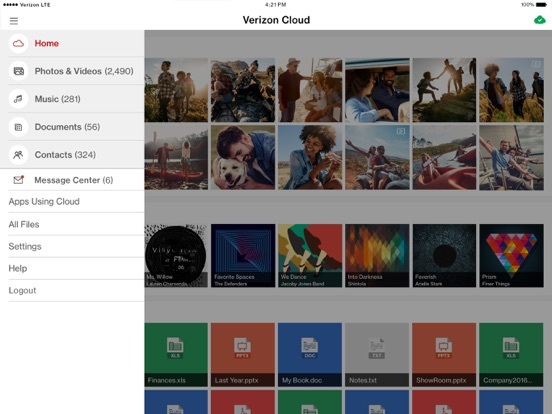 The Verizon cloud app can be downloaded and used on both iPhones and iPads. Go to www.vzw.com/cloud for the complete list. New Verizon subscribers: Download and install the Verizon cloud app on your iPhone for a 30-day Premium trial of 500GB of storage. You will automatically be billed $5/month once the trial ends. You can opt out of the trial through the Verizon cloud app at any time during the 30-day period and enjoy free 'Contacts Only' support. **edit: the app has been updated and I can finally download my pictures into the cloud. I cannot backup my videos and photos. I have the orange arrow and a message saying that it will take awhile for the backup to perform and then it goes back to the arrow. My storage is at 2% so I’m not sure if it’s from the iPhone updates or the app updated. But it’s frustrating. If it keeps it up, I’ll stick with google photos. Can’t see my cloud contents! having problems backing up my photos!!! I’ve had the Verizon Cloud for years and love it, that is until now! I can’t see any of my one thousand plus pictures (years worth) and it won’t let my back up anything. Please tell me my pictures are still there. I even pay for extra storage. Help please! It has taken over 7 days for information to back up from iCloud to Verizon cloud and it is still in the process. It continuously get stuck. The phone has been stuck on same day and time for two days now. This is absolutely ridiculous. I have it connected to WiFi T home and the WiFi is on and working so it obviously is this app. I have no idea how to make iCloud work for me. So please cancel my subscription. You should be able to sign in on ANY device and access the SAME Verizon Cloud. My niece is using my old phone and I thought I could backup over 9000 pics/vids to the Verizon Cloud on that phone and access it on my new phone by inputting my username/password... WRONG! It’s now HER Verizon Cloud with all of MY priceless photos/vids!! It took me over 72 hrs to back it all up and now I can’t access any of it from my new phone! I’m paying $10/month for increased storage bc of the amount I needed for nothing now on HER phone! Which means, I’ll need to pay another $10/month on my new phone if I ever get this mess straightened up! Fix this please! What’s the point in having username/password if I can’t access it on a different device? I also sat at my local Verizon store for 2 hours for them to tell me to call Customer Service bc I cannot access the Verizon Cloud app on my new phone at all now. When I try to sign in, it won’t recognize my password and so it changes the entire My Verizon app login as well. Your apps are very confusing and I’m fairly tech savvy. No instructions on how I can get list photos. The app doesn’t work anymore! Every time I try to backup my content my attempts keep failing! Please update this app! It was very useful but not so much anymore! I have questions about this app but don’t see an indication of where/how to ask? Not sure what happened. I updated and now all photos are gone? Still investigating. 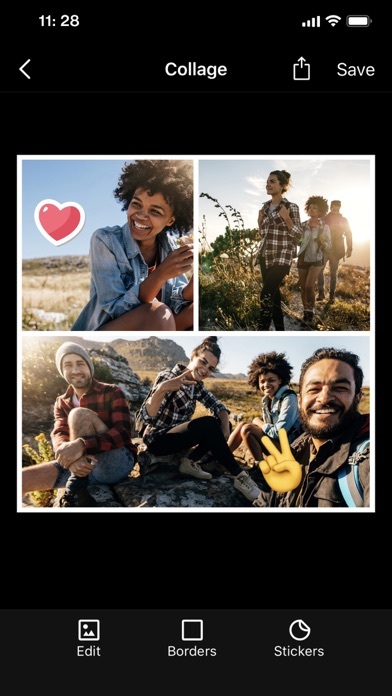 As I look at the recent reviews and others that are very upset about the app no longer allowing us to sync our photos, videos, contacts, etc - the major thing I see is the complete lack of responsibility taken by Verizon I’m actually doing something to fix the issue. All I see is the exact same response to every person. I shouldn't have to send an email to Verizon to get a result, not should anyone because you and I know that the email will just give another standard response for the customer to go to another department because they can’t fix it. Come on Verizon! We pay you more than we should because in the past you have been a great service but lately your house apps don’t work, I went from years of getting at least 4-5 bars to lucky to see 1 bar in my home and maybe 2-3 around town, and you keep wanting to charge more and more for service and for phones. Get your problems fixed, become the decent fairly priced service we had in the beginning, and take responsibility! It’s a lie that Contacts Only is a free service. I have spent several chat sessions with Verizon Wireless. Their agents don’t know their own products. One assured me that I just wouldn’t be charged if contacts only, Another supposedly set up backup assistant plus but he assured me it would just work in the background. Looking at support, it appears that it is not available for iPhone. Even though I asked specifically. Terrible customer service because they can’t give accurate information. I cannot for the life of me figure out why this app doesn’t just sync the photos automatically. It brings some and leaves a lot. Whats the deal? I have an iPhone. I know iPhone has a cloud but I chose to use Verizon. Yes. I have 6,000 photos. It took at least 12 hours to sync 1200 to the cloud. Now it has stopped and says it’s syncing but nothing for hours. I’ve tried it on wifi and data. I’m disappointed. I do not like the fact that Verizon wants to know where I’m at at all times. I have had this for years and today it paid off. My phone was. Run over by a car and my cloud had all my info, photos everything and it went right back on . Sign up for this and get daily spam ads for photo printing that you can’t unsubscribe from. You will get an alert, stop what you’re doing, dig your phone out of your pocket expecting a message from someone, and instead have your daily advertising blast from Verizon. Only way to fix it is to cancel your subscription. There are lots of other better and cheaper ways to back up stuff than Verizon anyway- iCloud for Apple. After hours support is horrible!!! 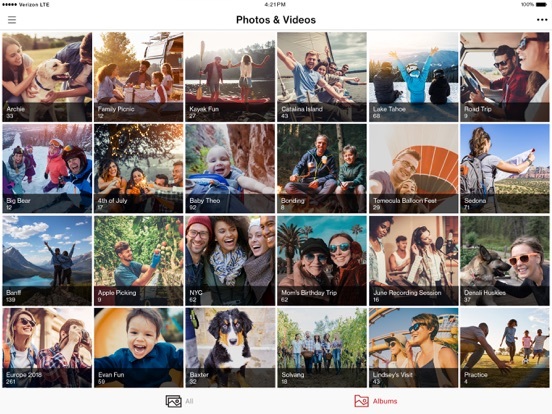 iCloud best way to save all your photos ! Stop changing for cloud usage!! Verizon has proven themselves eager to voluntarily sell everyone’s information to government agencies and third parties. You might as well send all of your personal information and pictures to social media and any of the three letter government agency’s servers. Backed up all photos and vids 3 times to the Verizon cloud. Only 3 of 48 vids uploaded and could not find a trace of all photos except 1 taken this year. Verizon help chat told me it takes 24 hours to see the photos and vids that were uploaded. That was two months ago. Worked for a brief period but now no matter what it doesn’t work. Agree with other 1 star or less reviews. The app will not back app your files like it’s supposed to. I try to back up but it does nothing. 256 740-1881 cancel cloud service 24Feb2019. I have tried multiple times to backup files and if if gets interrupted, it just starts over again doing the same pictures instead of picking up where it left off like it’s supposed to do. Kept giving me an error message. Waste of time! Doesn’t work at all! It’s very nice to have a dependable place to store my important pictures and documents. A phone backup after losing all data takes way too long. I’m finding nothing updates as it uploads. I have to go update everything later and my organizational plans are erased. I am going to spring for apple back-up and not spend a week getting my phone in order the next time. Thanks for keeping all of my photos though. I downloaded this app for my MacBook Air and it won’t load. I am now manually downloading photos but can’t seem to transfer them to my computer. This is a racket to add some dollars to your monthly bleed don’t get hooked in, find a different way to back up photos. There is nothing convenient about it. Please make it easier and more efficient to delete files!!! I backed up my phone one night in November of 2018, the next am All my contacts and pics were gone!!! Went to nearest Apple store, they were able to restore my contacts but not any of my photos because icloud would not recognize my password . I still have not been able to retrieve any of those pics that went back to 2008 the birth and baby pics of my 1st great grandchild. And pics of my grandson who has since died. So I’m afraid of iCloud losing my favorite pics again!!! Worked with someone for two hours today and still not updating photos on phone. Deleted and reloaded app. Need credit back for the charges for this app. I tried this for first time and thought it was gonna save my photos and videos but I was wrong. It takes forever to back up and forever to download my videos back. Left my phone on whole night for couple times trying to redownload my videos but didn’t even finish. All my short video downloaded fine but any video longer than 8 mins will never finish downloading or backing up. Couldn’t even back up my long video. Will never use this service again. Just before Christmas my app stopped backing up; every time I open the app and tap to back up, app states everything is backed up. I’ve used only 1% of my space so I know that’s not the problem. I have lots of pictures from Christmas I’d like to back up but app won’t do it. Why am I paying for an app that won’t work????? Update: now, all of my pics and videos are gone except for what did back up last month. Ridiculous!!!!! There is always a red 1 showing a notification on the app. I have no notifications. My messages are also empty. The app is garbage. Still has bugs even though ya’ll allegedly fixed it with an update 2 days ago. Still shows (2) notifications from unread emails that have been read at least 30 times in last week alone. If ya’ll cant fix it or stop with bs adds, Ill delete and discontinue service. I hear AT&T or Sprint would love my business. Can you please stop sending so many notifications on the same sale on prints over and over and over or tell me how to turn that off!!! I have gone to notification manager and turned it off there and they still keep coming, every hour on the hour...ENOUGH ALREADY PLEASE STOP IT IS INSANE!!!! I have had verizon cloud on back up for DAYS and it still shows 1 notification on the app..same thing with a notification about a message on there. I’ve opened it every day since the 27th and it keeps popping back up as a new message! Organiza todo en perfecto orden simplifica mis archivos por orden de fechas y localidades. The process meeter hangs or stops without and info to what’s going on. Does not update on its own. Whenever I open the app to check my contacts, the app goes into update mode and gives me an exclamation point. It failed to update. I then launch a manual update and it will succeed. This happens 3 times out of 4. There should be some sort of setting for me to set an update, in the background, on a regular basis. I have an iPhone X.
I was give an Apple Xr and the VZ cloud cold not get my Text on the New iPhone, unfortunately the content app did not work either, been working on the issues for 8 Days now and numerous calls to tech support and Apple support. Free free free and then you get a text saying verizon will start billing you in 30 days even though you never agreed to pay. I have found it backs up photos and contacts fine but crashes constantly with any large video files when updating from my phone. The app literally just shuts off in the middle or end of a large video file upload. Have reinstalled the app several times with no luck. Phone is an iphoneX and is up to date. I keep trying to delete and re download the app because it’s supposed to restore my text messages but it hasn’t why is the app not doing what it says ? Literally 5 seconds after updating the app I tried to open it & it keeps shutting down. It will not load at all. I pay for this app & expect it to work. FIX THIS! They deleted all my stored pictures from 12 years. Then tell me I can’t get them back because they removed them in June when I just looked through them at Christmas. And they keep switching people on the customer support so I have to keep explaining myself. Stupidest app for storage ever. Do not download. This app will not delete off my phone. I cannot access the cloud. Nothing seems to save to iCloud. I don’t like it at all!! My contacts and pictures are not backing up to the cloud!!!! I’m very disappointed in the Cloud as all of my pictures are not uploaded and I can’t get them uploaded. I loved this app at first but then it deleted all of my pictures and videos of my niece and nephew when they were babies. Those are memories and moments I can’t get back, and when they were erased there was a time period where you can go back to save them from being gone forever which I was unaware of. So by time I found out it was too late. Because of this I will continue to hate this app. I finally got curious enough about these notifications to see what it’s all about, really glad I did, it’s interesting to see a snapshot of your week. Thanks! It’s comforting to see the back up on a regular basis vs relying on my memory or an app working from behind view! Had all my photos backed up now the app keeps crashing every time it’s opened, so I can’t retrieve any of my saved photos. All was well until recently I decided to back up my pictures. Much to my dismay the app keeps closing out on me. Pretty awful paying for a service and not being able to use it. I do not want to pay an additional $5 a month for back up but can’t find where to cancel. Why are you going to add this to an already expensive bill for a senior citizen? Terrific service at Brick location! Ethan!! We have no choice what a scam. Continues to stop backing up. I, more often than not, have issues backing up data even though I keep my phone unlocked and don’t use it during the process. I pay for this service and I have had it for years and to this day I still can’t get my IPhone 8+ to back up with this app, it used to sit there and act like it was backing up my phone and you would have to keep the app open and not let your screen go black and I tried this so many times for hours and hours I even let it try and back up for a whole day, during this process you can’t use your phone at all or it will have to start the process all over again but after letting it back up for a whole day it never finished and when I gave up and checked on how much it was able to actually back up I was completely blown away that after 12 hours of me dedicating my phone to nothing but backing up my phone it accomplished absolutely nothing!!! Not a single file was ever added to my cloud all the stuff that I have in my cloud was from 3 or 4 phones ago so I have basically been pay for this service for years thinking that it was working this whole time when it never worked at all or at least not in years. Now all it does is crash every time you try and open it so it can’t even pretend to back up your phone now. I really hope that Verizon can fix this issue I know I can’t be the only one with this problem. Until this issue is fix I wouldn’t recommend using or purchasing any storage from this app!!! UPDATE: 2 week’s later, it still keeps saying that it’s backed up, but activate the app to finish. When I go into the app it does the jumping around - 3 minutes, 25 minutes, 17 minutes, 74 minutes! Got a note from the developers asking what device I’m using - what do you think Genius? I’m in the iPhone App Store, hmm? Could it be a Google Pixel I’m working with? I give up. Verizon has lost all their former glory. Used to be they were the best customer service And the best cell service around, but they got a fat head, they are now worse than circa 2005 AT&T! Can’t wait till this contract expires and I might go before that anyway. After 4 hours during which it kept saying 4 minutes left, and counting down to 1 min. Only to bounce back to 4 then 21, then back down, and then it said 43 minutes!!! What the?!? I finally had to cancel because I need to do other things. Why does it take so long? Why after 4 hours is it still not backed up?!? It’s less than 3 gigs for Pete’s sake! And why does it take half an hour to estimate the time it will take to only say like 4 minutes and then take another 4 HOURS to still not finish? Plus it seems to stop unless you keep your phone “awake”. This is the worst. It’s torture. Plus you can’t set it to back up, you have to do it manually! Was it written back in 1980 for a desktop and not really updated? When I installed it, it wouldn't let me access it and told me my email wasn't a valid email and so there I sat. I was pretty angry because it keeps telling me to load my Nook books etc to the Cloud or I would lose them. That it would delete them. but won't let me in. So consequently I've never been able to get anything to move to it. I loved Verizon. I went in a local store one summer day when my phone was frozen on a bad app and I might have lost my phone. But when I went in the store the tech said hang on a minute, this can be tricky but I saw someone do it and it was great. So I waited and he brought my phone back a couple minutes later, working like nothing had happened to it !! And did NOT charge me or whatever. Yayyy Verizon!! So what happened??? AND DEVELOPERS....I don't want you to give me the same blah blah answer you gave everyone else. That's not acceptable. You are the BIG BAD VERIZON CLOUD !!! Come on....Get a grip and get it together. We would like to use this app, which could be very handy if people could actually use it properly. Me Being Kind of Disgusted with the WHOLE DEAL. I thought I would give this app a try, since I get 500GB of storage free with my above unlimited plan. 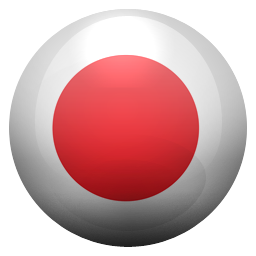 I uploaded a short video clip as a test, to make sure it worked. However I have spent the last month off and on trying to upload some HD videos I took on my phone, and the app refuses to complete the backup process, only getting to about 6% before stopping for seemingly no reason. this occurs even on a decently fast 20 megabits upload internet line! I also tried uploading 144 audio files from my computer, and though most of them made it, there were 4 Random files in that upload, that for whatever reason were never able to upload. This is not what I would call a reliable app for backing up anything, except for perhaps smaller files such as audio, but even then you may or may not successfully get your files uploaded. That’s not how any app that claims to back up content should work. What is going on here? If I could give 0 I would!!!!! I have paid for and had This App since it was first developed but over the past three years for me personally it has lost my trust! I lost my pics three to four times and when asking for assistance I got no help to retrieve them they were permanently gone! It changes my plan without me knowing I just had this happen to me again when I called she said Jan 31, but there are no notes and she couldn't tell me why it happened! I don't trust it at all!!!! I lost the pics of my grandmama and me who now has passed because I trusted this app and it failed me no I have no memories of me and my grandma! I hate this app!!! Better realizability and retrieval is needed when this app deletes all your stuff and set up a new profile even if it takes u a while to nice it's gone bc that's what happened to me I didn't know how long it had been missing either way it's not my fault!!! I'm so over paying for a service that doesn't hold up to its standards! While uploading pictures and videos is quick, the ability to view videos and pictures is lacking. When viewing pictures it takes several minutes for the picture quality to reach its original clarity. Sometimes pictures will never become clear and will stay fuzzy and won’t download back onto the phone’s albums. Videos take 10 minutes or more to fully buffer and be viewed. I like the ability to purchase printed pictures directly from the app, but when doing so, the pictures do not load by date, so you have to sift through thousands of unorganized pictures. 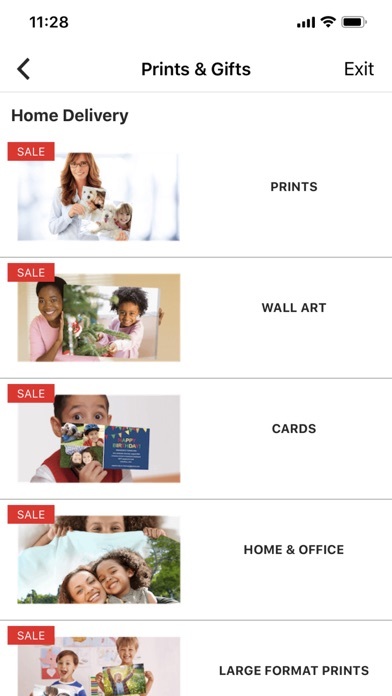 And, if you want to use a different photo printing service, you have to re-download all the pictures you want to print back onto your phone. Extremely cumbersome. I do not like this app and wish I would have stored my pictures elsewhere for easy access to view and print. Verizon went from a very functional contact backup to verizon cloud. OK. With Verizon cloud came 25gb of storage for contacts and photos and I think music. Ok. Now The most expensive carrier in the cell phone community has decided that they will not be offering the paltry 25gb for free anymore. 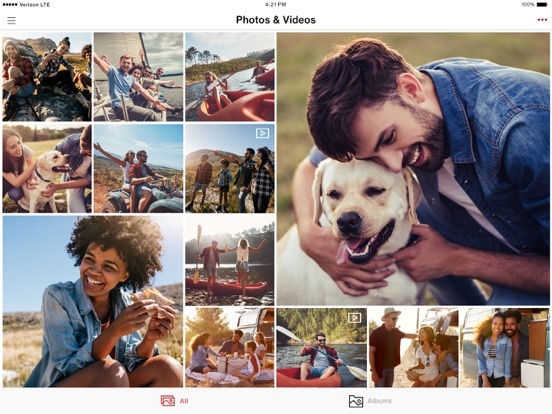 They will go back to the backing up of contacts(kinda obligatory for a cell phone company) but if you want cloud backup of pics and the like they have available subscriptions available starting at 1TB. Their unlimited data plan was disappointing and now this. I don’t know what they are thinking. But nickel and diming their customers is just not the way toward retention The above is an update I back up my pictures in Flikr or google photos. That is what they are designed to do. What I DONT understand is why this phone back up app does not properly back up contacts (I have multiples of almost every contact in my list. At least give us a way of understanding where all the duplicates are coming from) or the messages and voicemail that are specifically a function of the phone. I cannot figure out why everybody ignores the back up of messages and voicemails. If it is on my phone I should be able to back it up to the cloud and I should have the ability to access this information. I’ve had my photos backed up to Verizon Cloud for YEARS. I had 5gb worth of pictures in my cloud and I accessed them whenever I wanted. Recently, my beloved dog became ill and we decided it would be best to put him down... which is the worst decision I’ve ever had to make. I wanted to create a memorial piece for him with all the photos I have of him, and a majority of them were on my Verizon Cloud. So imagine my surprise when I went on there to retrieve them and they were all gone, just like that. I wasn’t notified not even once that my pictures would be deleted unless I upgraded to a “paid” version of the cloud. Never pegged Verizon for a company that cares more about profit than their customer’s precious memories but I was wrong. Guess who won’t be a Verizon customer for much longer; this is definitely a deal breaker. I’m having the same issue as Kerry. Verizon keeps saying one minute then two minutes than four minutes then four hours and then back down to 17 minutes etc. And you have to keep the app open for it to continue downloading. I have other stuff that I can be doing so I try this during the night while I am asleep and when I wake up eight hours later it is still downloading or saying it is. I just use Google drive now but now it keeps asking me through text to upgrade. Upgrade to what? My phone bill is already well over $200 a month with Verizon. They have great customer service but I am truly not sure what is going on with this app and if my pictures are saved or not! **update It only took me over an hour to get everything back BUT I HAVE ALL MY PICTURES BACK. If you're unable to log in using your email/username you can log in using your phone number. The app refused to backup my most current photos so I uninstalled it and downloaded it again and now it's refusing to let me sign in with my previous information on the app and online. I lost photos of deceased family members because of this. Everyone, do yourself a favor and get a flash drive or something more reliable. Without my consent, Verizon enrolled me in the cloud. Then they told me I would be charged $5 a month if I don’t opt out! What’s worse was in order to opt out, I was forced to download this app. Once I did that, it wasn’t obvious / easy to opt out. Thankfully I am fairly well-versed with computers - what about my elderly parents or other folks who struggle with smart phones?! The didn’t use the wording “opt out”, so I have to trust that deleting my account is the same as opting out and prevents the $5 monthly charge. UNETHICAL BUSINESS PRACTICE to enroll someone in a program without consent, force them to download an app to get out of the program, then make it difficult to find the way to opt out. Verizon must have known what they were doing and should be ashamed. You can select any contact that has been backed up, but you cannot delete them from your backed up file. 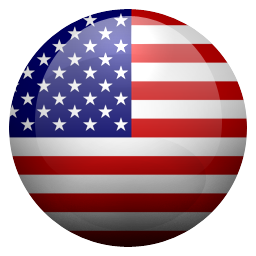 Plus I used this app to move contacts from my wife’s old phone to her new phone, it doubled many of them, and merged randomly phone numbers, addresses and names. My daughters texts were showing up as someone else entirely, amazingly her phone number had merged into someone else’s contact info (this happened in many places with random peoples info). I wanted to delete my contacts entirely in the back up file and start fresh, but that is impossible. Basically... I just deleted this App. Verizon... you blew it on this one. Horrible App would rate -stars if I could. I lost all my photos on the app because the she cancelled my cloud. I asked about extra storage for my 5c iPhone but she said I had the max. And she deleted the photos and videos but keep my contacts. Thanks to .Jesse and Hannah I have my pictures back but I still can't get on to cloud on my desktop and on my phone it goes on and immediately shuts off. Very disgusted. I am trying to back up my iPhone X I have about 1500 pictures and maybe 100 short videos. I am about 3/4 of the way done and now the app constantly crashes, it will not stay open for more than a couple seconds before crashing and sending me back to the home screen... I am not sure if this is an Apple problem or a Verizon problem but I am leaving all Apple products behind, I am done with Apple, they will not get another cent from me (not that they’d care because they don’t care about what their customers want). Hopefully I can get everything back up before my Note 9 gets here. I will give it a 5 star when it speeds up, Also when my phone goes to sleep it stops uploading. I have unlimited data (grandfathered in) and I pay more so it shouldn't be so slow. Other than that It’s sweet to be able to back up photos without paying for the app like Dropbox which I also pay for just to upgrade to have 500gb I take A LOTTTT of phones and make videos so I need all the speed and storage I can get. This app is useless, it will not stay open, every time I open it it just shuts down, update didn't fix the problem. Originally gave this one star as it wouldn't open, but after a lot of help from the Verizon support team we got the issue fixed and it now works great. Ended up being an account glitch and not the app. I have a big issue with this app it backs up everything more then once when it backs up. You can go back in and delete pictures that have been repeatedly backed up but who wants to do that especially if you originally have over 5 thousand pictures and you can’t delete any extras when it comes to your contacts. So now I don’t have space because of all of the replicas. Just awful not happy will be discontinuing the service if it’s not fixed. I’ll try to clear it and start over but if it happens again because it’s not fixed then I’m done with it. I had an issue where my iPhone 6a plus disabled therefore leaving me with no choice but to factory rest my phone. It was awful. I thought I had lost everything to include pictures of my dog that I put down on 2017. LUCKILY, everything was on this app, I am still waiting to see if the pictures of my dog are on here but I am happy with the backup already. I recently reviewed this app at 1 stars due to the iOS 11 compatibility issues. I feel they should have been ahead of the problem as this is such an essential app but I feel they fixed it pretty quickly. Customer service saw my review and contacted me immediately. It’s an app that you shouldn’t go with out. Thanks for fixing the issues. Never realized I could take photos on my Samsung Galaxy S8 phone, have them automatically saved in the Verizon Cloud and am now viewing the same photos on my iPad. What a great concept! LOL I guess you can tell I’m a little late getting up to speed on the technology available to me. 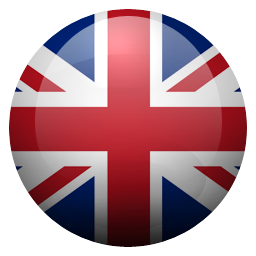 The price is reasonable and the app is very easy to use. Full disclosure, I’m a retiree of a subsidiary of Verizon. In regards to the above review titled , “worse ever.” I had the same problem and it turns out I ended up getting an upgraded phone with more memory and it worked 100 times better. It acted exactly how you described and I wanted to scream! The reply that you got from Verizon was unacceptable. They should know what devices have issues and should list which phones and memory can be used with the cloud! It would save a lot of time headache and frustration! This app does NOT upload ALL photos and videos automatically. I had to, several times, choose all photos and manually upload them. Then you get notifications about stupid ads, products, and services that no one cannot opt out of, and the only way to get rid of the notification is to go into the app and open the stupid ad. 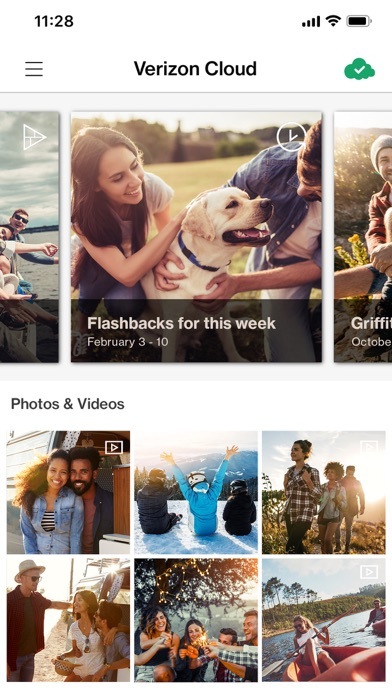 Do not pay for Verizon storage, use Google Photos. 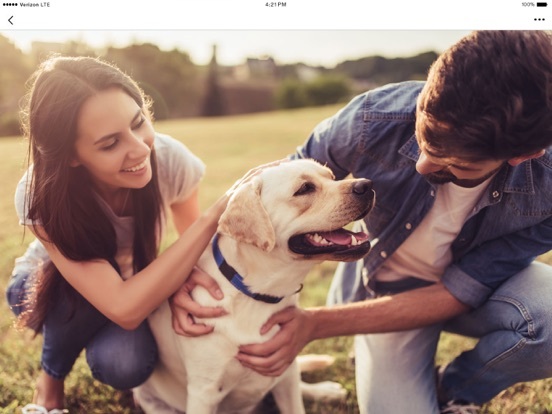 Not only is Google Photos FREE but it uploads ALL of your media automatically and no annoying notifications for products and services you do not want. Okay I’m getting frustrated now. Something tell me to rate the app ha perfect because I’ve had nothing but trouble. I go to the reviews and not only am i but other people are wondering why the same thing... THE LIBRARY WON’T BACK UP!!!!!! Helllllp me this is horrible! Then y’all have the nerve to want somebody to pay to use the app please you won’t get a penny from me this is unacceptable!!! After instantly realizing I had ordered a photo in the wrong medium: acrylic instead of canvas, I was informed that there was no way they could cancel the order even when I called immediately after placing it. BUT then they immediately refunded my money after I received BOTH items! That’s what I call customer service. I have an iPhone 7, and the app won't even pass the loading screen. No idea why it won't actually get into the app. App is fully updated as well as my phone. Update: I click on the app to open it and it starts to load. Once I leave the app and immediately try and go back in, then I'm able to pass the loading screen. Odd that's what I have to do, but at least it works. 3 stars until that bug is fixed and then a 5 star. Update: No more issues with the app. I’m able to click it and it finally enters the app with no issues. No longer have to leave the app and open the 2nd time to make it work. Finally!!! I’ve been a Verizon customer for a few years now and I’ve never had any serious issues with this app until recently. I cannot get the app to load for the life of me every time I try to open it force closes. Not too sure when the last time the app was update as I usually have my phone auto-update. This needs to be fixed ASAP!!!!! Thank you! Once this issue is resolved I will gladly give 5 stars as deserved. I have an iPhone and I was having issues with the iCloud that wouldn't let me back my phone up. Used this app to back it up, just in time since I had broken my phone a few days later. Got a new phone, downloaded this app and all my stuff was there and put on my new phone. Didn’t give me a warning that all my pictures were going to be deleted off it, so I didn’t have them backed up to anything else because obviously I thought this Verizon cloud thing was better than iCloud. My mistake...switching to Dropbox. I had pictures on there that I’m can never get back now! Love it! I have the iPhone 6p (64gb). It takes no time at all to back up and store my photos. It doesn't do my music though. Don't know why it say there is none. Maybe I'm not doing something right? I also notice you can stream to TV? Don't know how to do that either. I'm somewhat tech savvy but at 67 not completely tech savvy. Too many changes within this company that greed has sunken in. As much as customers pay a month for service, more FREE features should be included and NOT added on for an additional price. As with any customer, i want exceptional service with a provider that can tailor mobile/data plans at an affordable cost. Verizon changes plans and catergorizes them into sizes that end up being too much or not enough. Either way, you the customer, is overpaying and more changes will keep going into effect as to make even greater profits. This is just a money making app for Verizon. It may be good if it is the only app you use for storage. But if you have other means of storage (I.e., iCloud, One Drive, Space Monkey, Airdrop, etc.) it duplicates what you have already saved then charges you for extra data because you exceeded your data allowance for the month. I guess so - you have uploaded the exact same data 3-4 times. Who needs that many copies of anything? I deleted it from my apps after they charged me for extra data 2 months in a row. I finally got smart & saved money! I’m tired of all the developers forcing us to upgrade to “premium” in order to maintain our “FREE” access. It’s not that important to me to store in the cloud so I will let this app die it’s slow death. If I need a cloud service I will only pay for one of my choosing! My laptop and expansion drive can hold what’s most important anything else is just not necessary. Sure my hard drive could crash! OMG! Who cares! Our grandparents got along just fine without all this technology. We will survive as well. It took a while but I finally got all 13,000 of my photos/videos backed up into the cloud. But now when I want to go in and backup new images, it starts going through old images first like it's going to back them up again. I watch the old images go by as it says 1 min left and then it doesn't get to the new ones to download. It just sits there on old images or says everything is backed up and stops. But it doesn't download the new ones I took that day. What is wrong with this app??? Your Free Verizon Cloud service will expire on December 22, 2017. To avoid losing your media content, upgrade to a Verizon Cloud Premium option. If you choose NOT to upgrade, you will still be able to back up and store your contacts, but your stored media content will be removed from the cloud. For instructions on how to download content from your cloud so you don’t lose it, access the Verizon Cloud FAQs here. 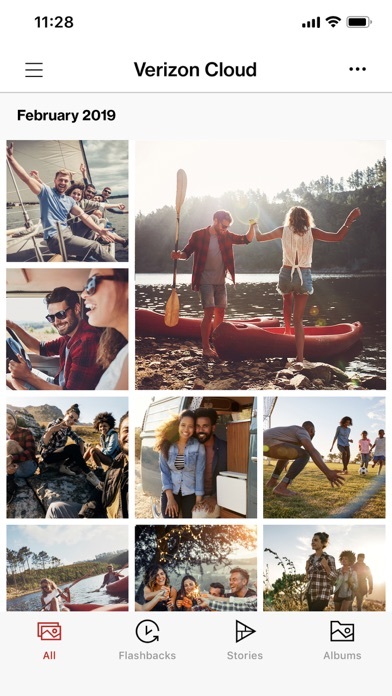 With Verizon Cloud Premium you will be able to continue storing all of your photos, videos, music, documents and more. I recently had to switch phone bc i had default n i made sure to back up everything on icloud esp my pics but it still didn’t save my pictures from a month ago but this app had all my pictures up to the day i switched the phones! I was so releaved def a life savor! I agree with the first review I read here. I have been a Verizon customer for many years. I experience many regular service bugs and largely it’s due to my established number that I’m still a customer. We got it for our new business and we have continuously been let down by wi-fi, connectivity/network issues. The only thing Verizon seems to do consistently is inform us of our financial obligations. Service and standards have indeed taken a huge dive. I’d downloaded this app sometime last year and only recently noticed that it had changed. All the pictures (that took HOURS) to download are gone. All I have left are my ‘free contacts’. What about my pictures? Do I have to pay to access them? Are they gone forever? I guess I won’t know because I will not pay the $5. In the future, they should let all Verizon Cloud users know if they’re going to change things and explain that the change could result in them losing saved information. As the title states: so far, so good! The app has been uploading my photos and it’s great so far knowing they are backed up. Although, here is a personal forewarn: Always back up to the cloud as a secondary plan because the cloud is not always reliable. Have your main backup on the computer. Anyway, app works great so far! What’s the point of backing up your contacts if you can’t restore them back onto your phone. Lost a bunch of random contacts, luckily still had them saved on the cloud, and thanks to the tech that had me sync and backup again on the app, lost the missing numbers I had. Now I have no clue who I’m missing and I can’t get them back. After googling the problem sounds like this has been an issue for a long time with Verizon cloud. Back up and restore. It’s not that difficult. Time to find a better app. I love Verizon Cloud! I have trouble with losing my phones, breaking them, and yes even had them stolen; however, Verizon Cloud continues to store my backups from multiple devices! 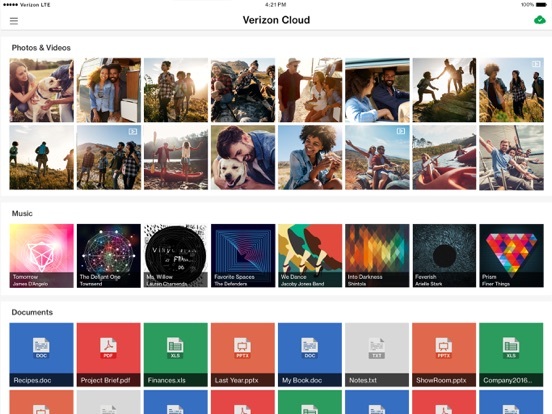 If I could change one thing I wish the Iphone’s auto “cloud” backup would back up to the cloud of my choice, i.e., Verizon Cloud, instead of using Apple. I had all my pictures backed up to the cloud and had NO idea that I now had to pay to access my photos! It wasn’t until I was attempting to search for a photo that I needed that I was blindsided by their new pay service. I’ve been a Verizon customer for years. I even stuck with them when they decided to discontinue their unlimited service the first time. I was previously on the fence about switching companies but this is the final straw. I’m officially done with Verizon. Years of memories lost! Anything involving a "cloud" seems to fail. Even some games use a cloud and they loose data regularly. This is no different, backed up contacts before getting a new phone, would you know, the recent contacts don't exist. Important phone numbers are gone. Quit with the cloud nonsense and you will quit failing. Update: There are actually no phone numbers I can directly go through to talk to a person needs the phones keep making me put in a pin and resetting my account pin screwing up everything. Shanghai Jia Feng Software Co. Ltd.